It is often said that “content is king”. However, more content is not necessarily better. Content must stay focused on the subject of the site. Sections should only contain information that is closely related. Pages should focus on a single topic and contain variations of key phrases to be relevant for a wide range of searches. So how do you create great copy? The key to creating great content is to think in terms of solving a problem. Then describe the problem and the solution in generic terms. It’s fine to use industry phrases if those are the common terms a prospect would use to find your products and services, but unless your product names are as ubiquitous as Kleenex or Xerox, you need to avoid terms that are specific to your company. Keep the sales funnel in mind. If you write to improve your prospects understanding, they will be more aware of the size and scope of the problem. Their interest and desire to find a solution will grow and finally they will take to action to solve it. The Search Funnel views the Sales Funnel from a keyword perspective. When a person starts looking for a solution to their problem, they start with very general terms and then get more specific with their searches as they learn more about terminology, brands and model numbers. Perhaps you started with a broad search phrase like “rank better in Google”, and as you read through the results, you determined that what you needed was “search engine marketing” or SEO. Then maybe you searched further and determined you wanted a “link building” or a “pay per click” campaign. 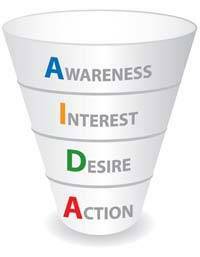 Keeping this in mind will help you write content to capture searches at each stage of the sales funnel. When describing your products and services remember that people approach a problem from different perspectives. End users will want to know how your product or service will benefit them. How it will make things better, easier, faster. While technical buyers will want to understand how it works, the specifications and why that product or service is technically superior. And a financial buyer will want to know why your approach is the most cost effective solution. Addressing each of these mindsets in your copy will not only result in more content, but content that will capture a more searches, and close more business. Last but not least, consider hiring a professional copywriter to create or polish your copy. A copywriter brings an outside perspective that is almost guaranteed to root out needless jargon and confusing terminology.